Pincher Creek Emergency Services responded to a single vehicle motorcycle collision on Highway 22 approximately 15 km north of Highway 3 earlier today, June 26, at approximately 10:30 am. The motorcyclist sustained minor injuries and was transported to Pincher Creek Hospital. 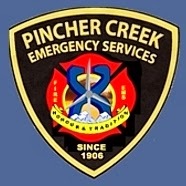 Pincher Creek Emergency Services responded with an ambulance and rescue vehicle and Lundbreck Fire also responded.